Karen Tyrrell is an experienced Brisbane school teacher and keynote speaker. Karen won three awards, four literary grants and a mentorship through the Society of Editors (QLD). She is a writing tutor for Queensland Writers Centre and Brisbane City Libraries. Karen’s seven acclaimed children’s books Bailey Beats the Blah, STOP the Bully, Harry Helps Grandpa Remember, Super Space Kids Series, Song Bird Superhero (Song Bird 1) and The Battle of Bug World (Song Bird 2) ignite imagination and positive self-esteem. All books are available at the festival via Sandy Pages book shop in the Coolum Civic Hall nearby. 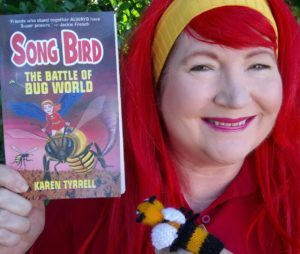 Karen Tyrrell (that’s me) performs Song Bird Superhero Battles Bug World with costumes and props. 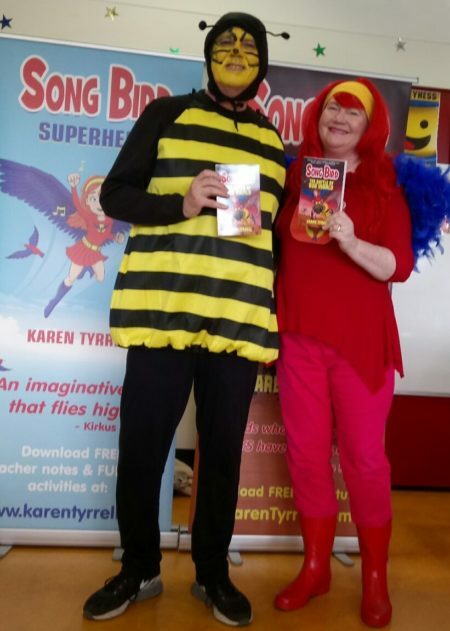 Her side-kick Super Bee AKA Steve Tyrrell shares tips on how to save bees and reads from his guest author chapter, chapter 6. These are her latest books in an empowering book series that help kids live STRONG, utilizing humour and self-belief. Karen gives out FREE Capilano Honey bags with the purchase of The Battle of Bug World. You have done it! Your book is published, but now you have to sell it. Join these three prolific and successful authors on ‘a tour of an author’s tour’. Three children’s authors (including me) share our pro-active advice on how to get your books out to the world. We reveal our tips for Blog Tours and Book Tours. WHO else is on the Sunshine Coast children’s program? Elaine Ouston, Dimity Powell, Chris Collin, Dee White, Casey Ardron, Dean O’Brien, Gayle Torrens. All kids under 13 are FREE. Who’s joining the FUN? … Can you please spread the NEWS? Aww thanks Louise. I can’t wait to meet you at Coollum Beach on the 13th August 9 am or 1pm.